Trilogy Lake Norman is Shea Homes' newest community in the Charlotte, North Carolina area. True to their Trilogy brand, this resort-style community will offer amazing indoor and outdoor amenities needed to live life to the fullest. With several floor plans to choose from, homebuyers can find the home that's just right for them. Life in this active lifestyle neighborhood begins within the community but is enriched by the surrounding area. Homeowners are just minutes from beautiful Lake Norman, shopping areas, and world-class attractions in Charlotte. The centerpiece of this community is a 30,000 square foot clubhouse. Residents are greeted with a luxurious grand living room. Social areas include gathering rooms, a lounge, and Signature Restaurant. Stay in terrific shape with the fitness center or indoor lap pool. Prepare a meal for friends in the catering kitchen. Endless educational opportunities will be easily available because plans also call for a demonstration kitchen and classrooms. Trilogy Lake Norman sits on over 600 acres and has easy access to Lake Norman and miles of scenic walking and biking trails. There is also a beautiful pool and patio for relaxing on sunny days. Tennis and pickleball courts are available for some friendly competition, while event lawns host activities for neighbors to get to know each other. Trilogy Lake Norman is offering nine floor plans ranging from 1,364 to 2,550 square feet with loft options available as well. Homeowners from all over the nation have already expressed interest in the residences that will be offered at Trilogy Lake Norman. Homebuyers can rest assured that their home is being developed by a trusted builder. Shea Homes has developed many resort-style communities throughout the country. Shea Homes offers three home collections: Creekside, Ridgeline, and Shea. The Creekside Collection offers four different floor plans. These plans range from approximately 1,364 to 2,112 square feet. They have two to three bedrooms, two to two-and-a-half bathrooms, and an attached two-car garage. Some plans also offer a den for additional living space. The Shea Collection has three floor plans that offer various options. These homes range from 1,903 to 2,550 square feet. They offer two to three bedrooms, two to three-and-a-half bathrooms, and an attached two-car garage. All plans feature an additional den for either extra space or an extra bedroom. The Ridgeline Collection features two floor plans. Ranging from 2,132 to 2,505 square feet, these plans offer two to three bedrooms, two-and-a-half bathrooms and an attached two to two-and-a-half-car garage. These homes also offer a den for additional living space. Residents will also love that these homes feature a courtyard and a covered patio. A full-time activities director is on hand to organize clubs, events, and interest groups. Homeowners within Trilogy Lake Norman enjoy a luxurious low-maintenance lifestyle with like-minded friends. Spend your days relaxing poolside or challenge neighbors to games of tennis or pickleball. Residents will also have access to multiple clubs, including art, photography, chess, garden, and hiking. Common interest groups will include singles, wine connoisseurs, veterans, and Macintosh users. Get into shape with dance, cycling, or bocce ball. Whatever your hobby or interest, Trilogy Lake Norman will offer it. Not only is Trilogy Lake Norman going to offer everything for homeowners within their gates, it's also ideally situated just 25 minutes from Charlotte Douglas International Airport. Just down the street from the community is a Walmart, Lowe's, and restaurants. Getting around the area is a breeze with Route 16 nearby. Charlotte has beautiful tree-lined streets, historic homes, museums, and world-class restaurants that are just a few minutes away. Golfers will love having Cowan's Ford Country Club right around the corner while, for some outdoor recreation, Lake Norman is a couple of minutes from the community. Denver, North Carolina also offers a marina, vast outdoor spaces, and an antique mall. There are plenty of activities available in Trilogy® Lake Norman. Here is a sample of some of the clubs, activities and classes offered here. The Creekside Collection by Trilogy offers four different floor plans. These plans range from approximately 1,364 to 2,112 square feet. They have two to three bedrooms, two to two-and-a-half bathrooms, and an attached two-car garage. Some plans also offer a den for additional living space. In the Trail Collection you can find single-family homes ranging anywhere from 1,345 to 1,628 square feet. These homes offer one or two bedrooms, one to two bathrooms, and an attached one to two-car garage. The Harper floor plan offers a den as a substitute for a second bedroom. The Ridgeline Collection by Trilogy features two floor plans. Ranging from 2,132 to 2,505 square feet, these plans offer two to three bedrooms, two-and-a-half bathrooms and an attached two to two-and-a-half-car garage. These homes also offer a den for additional living space. Residents will also love that these homes feature a courtyard and a covered patio. Shea Homes does a great job with all of their communities and Trilogy Lake Norman is no exception. Their floorplans and construction quality are top-of-the-line. The community is exquisite and the neighbors are super nice. Couldn't be happier! 55places.com is not affiliated with the developer(s) or homeowners association of Trilogy® Lake Norman. The information you submit is distributed to a 55places.com Partner Agent, who is a licensed real estate agent. 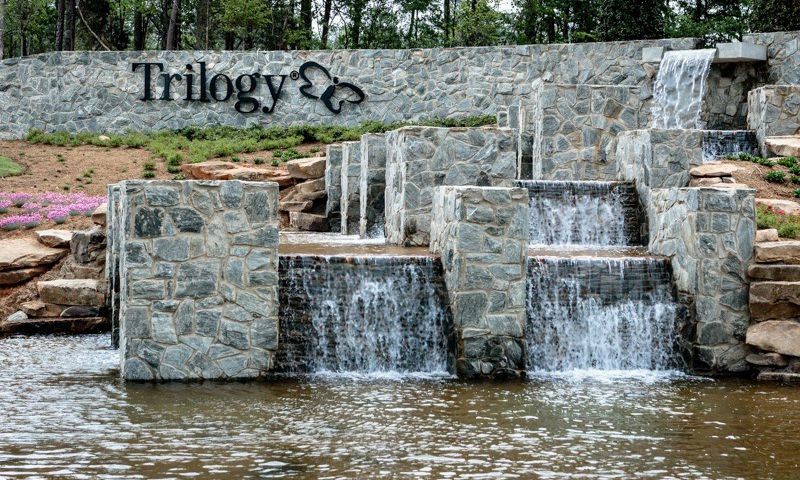 The information regarding Trilogy® Lake Norman has not been verified or approved by the developer or homeowners association. Please verify all information prior to purchasing. 55places.com is not responsible for any errors regarding the information displayed on this website.